The Fountain at Villa Medici a simple fountain in a very peaceful location in front of Villa Medici, just a little bit north from the top of the Spanish Steps. The fountain consists of an ancient basin of red granite about 13 feet across resting on a large octagonal baluster which sits in an octagonal water pool. It was designed by Annibale Lippi in 1589. The reason the site is so peaceful is that it's located on a road which has very little traffic, along the edge of the Pincian Hill and therefore overlooks Rome with a spectacular view. This fountain is one of the four fountains that Ottorino Respighi depicted in his Roman Trilogy, and his depiction of the serenity of this fountain at sunset is a prefect expression of the mood at this fountian. During the fall of 2013, the fountain was covered while undergoing renovation, and my photo of the fountain is through this covering. This makes at least 7 things that are undergoing renovation in fall of 2013, the other six being the Arch of Constantine, the Pyramid of Cestius, the Colosseum, the Triton Fountain, the Bernini Fountain and the Fountain of Ponte Sisto. 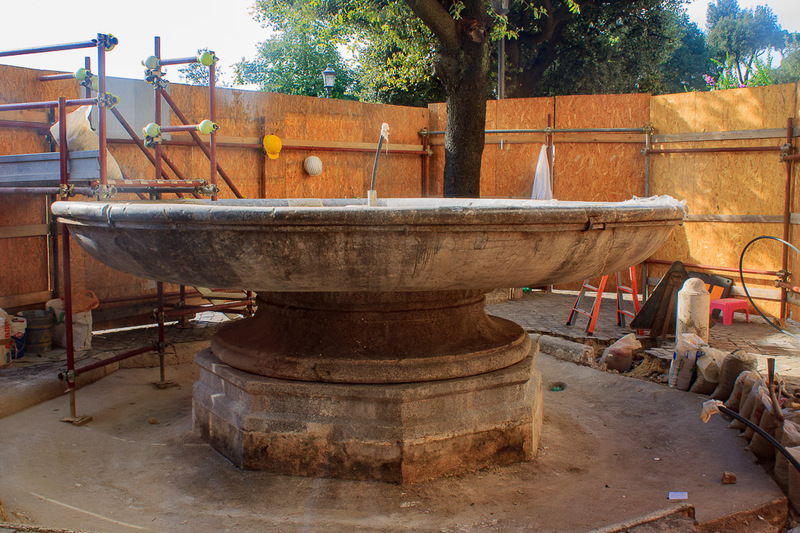 See all Fountain at Villa Medici photos.